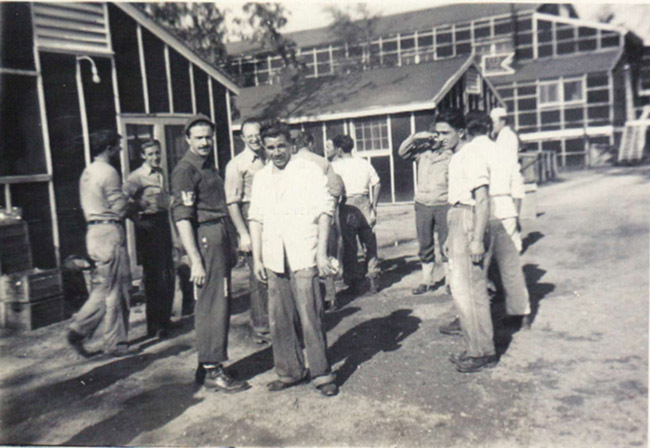 Italian prisoners of war outside a mess hall in the Garrison Echelon. Photo courtesy of the Drew County Archives. Arkansas played an important role during World War II. It was the location of three prisoner of war camps (Fort Chaffee near Fort Smith, Camp Robinson near Little Rock, and Camp Monticello in Monticello) and two Japanese American Internment camps (Rohwer and Jerome in southeast Arkansas). Archeological research at World War II sites is uncovering important information about the everyday lives of the interned. Dr. Jodi Barnes with the Arkansas Archeological Survey’s University of Arkansas at Monticello Research Station conducted the first comprehensive study of Arkansas’s Home Front heritage, with a study of Camp Monticello, the Italian prisoner of war camp. Camp Monticello, located in southeast Arkansas, served as a Prisoner of War camp for Italians from 1943 to 1946. Following the Geneva Convention the camp was planned according to the specifications of “the standard plan for three thousand man alien internment camps” with three compounds, hospital facilities, and a garrison echelon. After a number of negotiations, the camp was expanded in 1943 with additional hospital facilities and two additional compounds for officers and generals. The British had captured much of the Italian high command at Tobruk and elsewhere in North Africa and many of these officers were interned in Monticello. The spatial arrangement of the camp, which consists of two officers’ compounds and three enlisted men’s compounds, structured the lives of the prisoners of war. The institution provided the inmates’ food, clothing, and possessions. Archaeological research uncovered personal items, mess hall menus, and a chapel. These artifacts reveal intimate information about the men and the ways they worked together to maintain their cultural identities and regain some of their individuality.